A classic appetizer is turned into a tasty pasta dish! 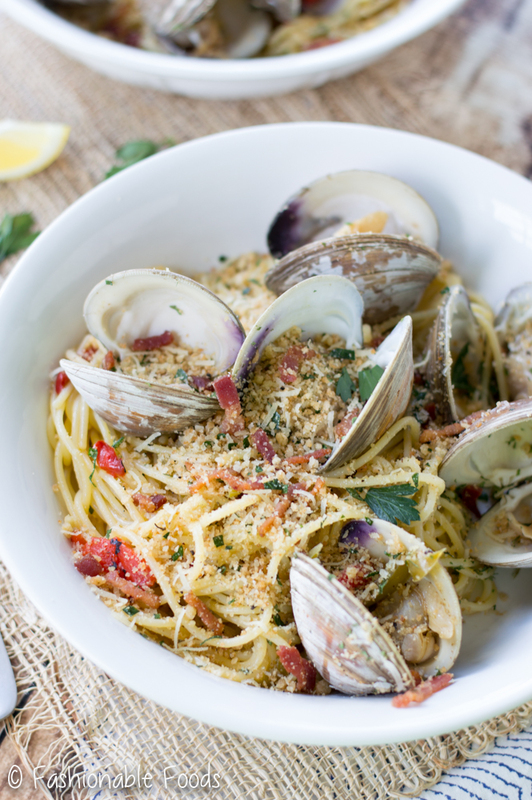 Clams casino pasta is a simple dish that is packed with flavor! Hello friends! How are you? Can you believe that we are just two short weeks away from Labor Day? Why does summer go by so darn fast? I’m sure we will still have a few more weeks after Labor Day to enjoy sunshine and corn on the cob. At least I sure hope so! Anyway, did you have a nice weekend? Ours was pretty chill. On Saturday morning we planted the fall crops in the garden! Other than it being insanely humid, it was fun. We planted more tomatoes, carrots, peas, cabbage, cauliflower, broccoli, brussels sprouts, kale, and radishes. I still have some spinach and arugula seeds to plant, but those don’t have to go in for another couple of weeks. As much as I hate to see summer go, I am really excited for these fall veggies! Back in February I shared my recipe for clams casino, which up until New Year’s Even I had never even had before. It was love at first bite, though, and anytime I get my hands on some fresh clams I always make clams casino. Kyle is a huge fan of clams and he especially loves a pasta with clam sauce. We picked up some clams and he requested both clams casino and pasta with clam sauce, so I decided to combine the two! What a fabulous combination it is! All of the elements of clams casino are here – bacon, sautéed shallots, peppers, garlic, lemon, breadcrumbs, parsley, garlic, and parmesan. We start out by crisping up the bacon (yum!) and then setting that aside to use for topping. Then, cook the shallots, peppers, and garlic IN the rendered bacon fat. Add in some lemon and vermouth and you’ve got a fantastic base for steaming the clams. 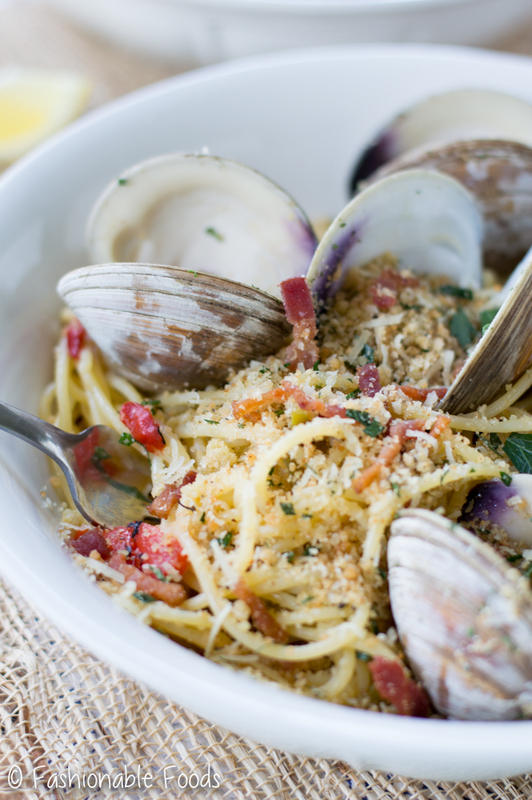 While the clams are steaming and the pasta is cooking, you can make the topping. 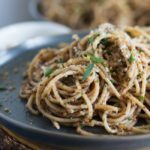 It’s basically just toasted garlicky breadcrumbs tossed with parsley, lemon zest, parmesan and the reserved crispy bacon. Once you try the topping, you’ll want to top all your future pasta dishes with it! ? 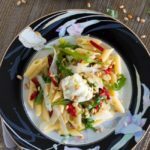 It’s such a simple pasta dish that packs in a ton of mouthwatering flavor. I had trouble controlling myself with this one.. I may have eaten it straight out of the pan ?. You may notice the only salt in the recipe is used for the pasta water. This is because you don’t need any additional salt since we’ve got bacon, parmesan, and the liquid the clams leave off tends to be salty. If you plan on having leftovers, keep the topping separate and add it to each individual serving when you heat them up. This helps keep the breadcrumbs and bacon crispy! I had the perfect amount of liquid for tossing my pasta, but if yours seems dry, simply save some pasta water and add some of it in to get the right consistency. Bring a large pot of water to a rolling boil and season the water generously with salt. Add in the spaghetti and cook one minute less than the package instructions. Meanwhile, in a large, deep skillet, add in the bacon and cook until crisp. Drain the bacon on paper towels and set aside. Add the shallots, bell pepper, and garlic to the rendered bacon fat. Cook the vegetables until they start to soften, about 2-3 minutes. Season with pepper and add in the vermouth and lemon juice. Add the clams to the pan and cover with a tight-fitting lid. 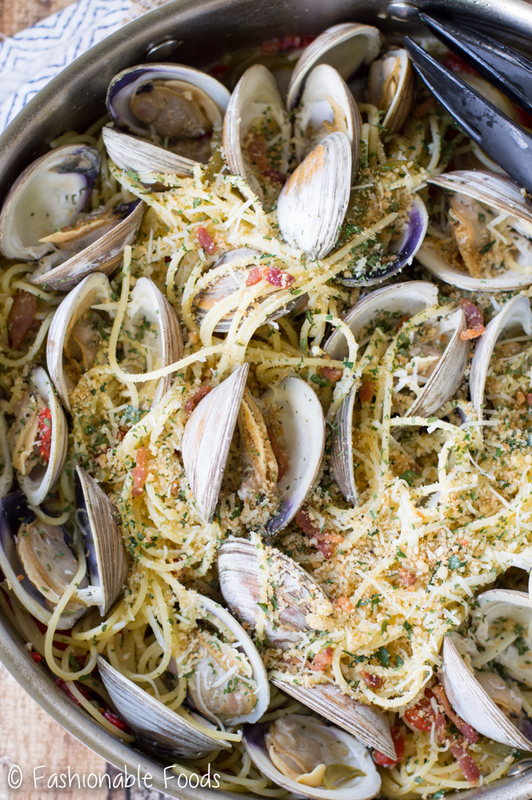 Allow the clams to steam just until the open – I like to remove them as they open to avoid any overcooking! 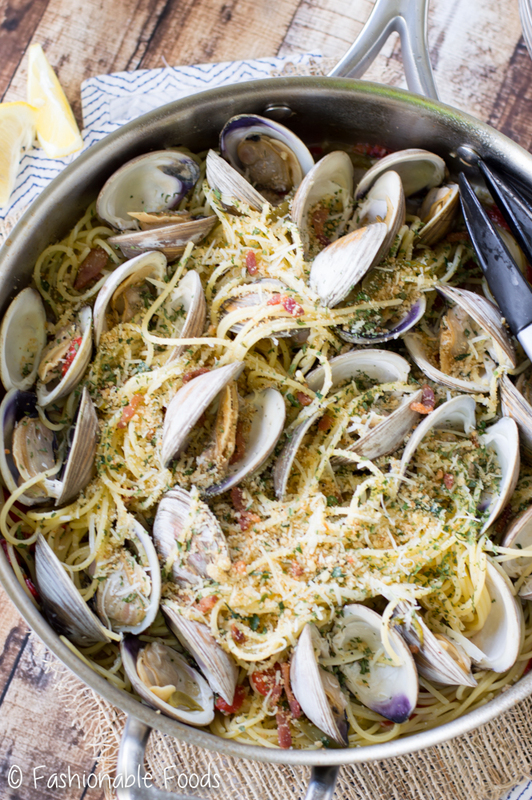 Toss the cooked pasta with clam sauce and add the clams back in. Make the topping by melting the butter with the garlic in a small skillet. Add in the breadcrumbs and toast them for about a minute. Stir in the parmesan cheese, parsley, lemon zest, and reserved bacon. Season with pepper to taste. Sprinkle the topping over the pasta and serve! 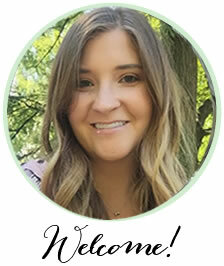 Sounds like you had a productive weekend, girlfriend! I bet planting your autumn produce helps being okay with summer being close to over. I’m looking forward to fall, but I will seriously miss all the corn! And tomatoes! And fruit. 😉 This pasta looks delish, girlfriend! 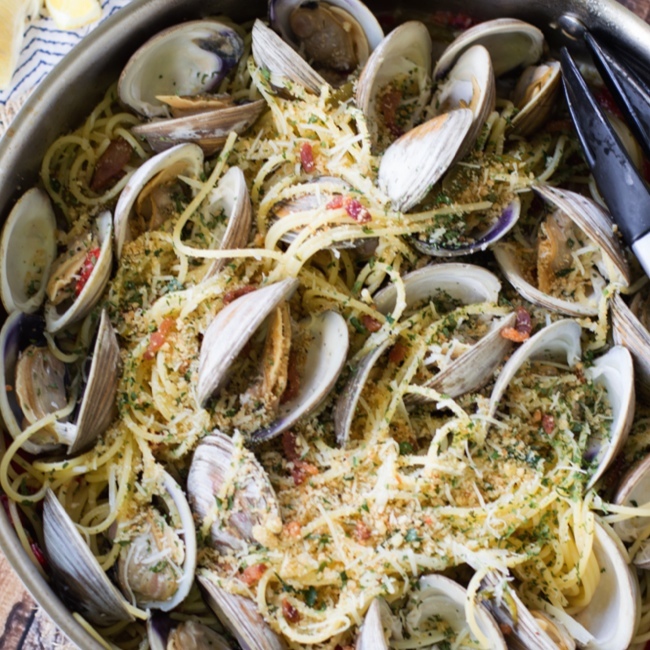 I’m a huge fan of clams casino, so turning that into a pasta dish is GENIUS! I totally want to face plant into a big ‘ole pot of this!! Cheers, Keri! Thanks Cheyanne! Yes, it does help with the end of summer sadness I have. For now, though, I’m eating as much corn, tomatoes, and fresh summer fruit as I can! I totally did a face plant into this pot of pasta , but shh don’t tell anyone ? Time is sure flying by! I can’t believe it’s almost Labor Day! This pasta looks absolutely gorgeous, Keri! I’ve never made anything with clams before, though I do love it. I would love to settle down with this comfort dish! Pinned! Thanks, Gayle! 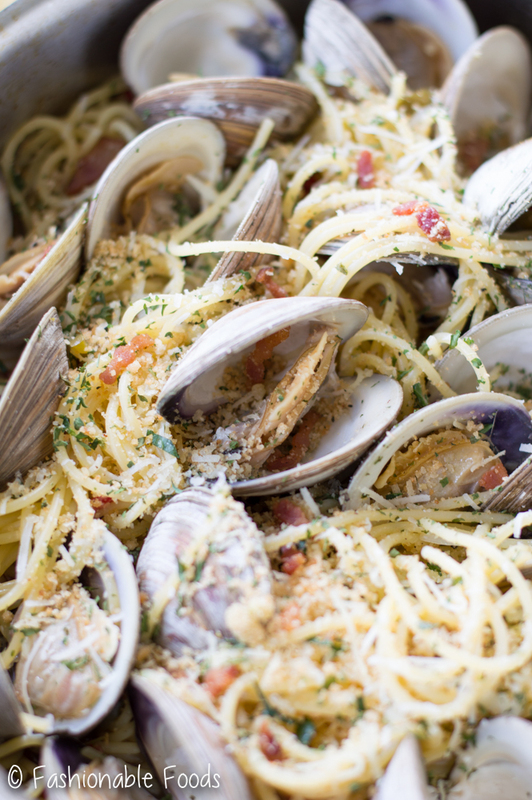 Clams are surprisingly easy to cook with – I used to avoid them for some reason, but now I make them quite a bit! That’s so nice of you to say! Opening a restaurant would be a dream.. maybe someday! 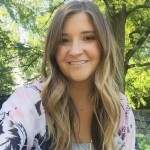 Keri…which gluten free pasta do you prefer? Barilla… I find it cooks up the best without turning to mush. Just start checking it about two minutes before the directions say because gf pasta is so easy to overcook. Then rinse it – makes a huge difference!! 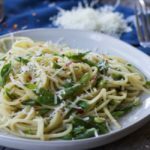 Has anyone actually made this recipe? We just need to know if it’s worth the time!